Skip Denison at Denison Yacht Sales sends word of a $146,000 price drop on the 36m raised pilothouse motor yacht Wanderlust. Built by Denison in 1985 to a design by Joe Langlois, this superyacht underwent an extensive interior refit in 2006/2007, at a cost of more than $1 million. An interior by Dee Robinson accommodates up to nine guests in a full-beam master suite, VIP cabin plus a twin and a further cabin sleeping three guests. A planing hull and twin 1,960hp MTU engines give her a range of 600 nautical miles at her cruising speed of 20 knots. 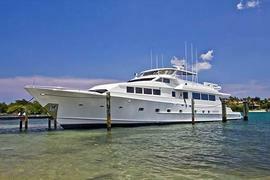 Lying in Palm Beach, Florida, Wanderlust is down from $995,000 to $849,000.